At the Punta Arenas Airport, we board our chartered jet for the 4¼ hour flight to Antarctica. Our route crosses the Drake Passage, then follows the west side of the Antarctic Peninsula and the spine of the Ellsworth Mountains. 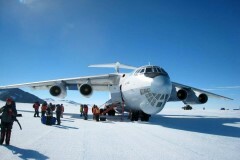 We land on a naturally occurring blue-ice runway on Union Glacier where you will take your first steps on Antarctica. Climb aboard one of our specially-adapted vans for the 5 mi (8 km) shuttle to our main camp. Our friendly staff will provide a welcome tour of camp and show you to your tent. Named in the 1960s after geologist Benjamin Drake IV, this impressive icefall tumbles off the polar plateau into Union Glacier. 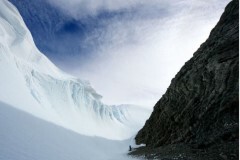 Winds from the South Pole carve huge, crevasse-free waves into the blue-ice and polish the surface into a high shine. If you’d prefer to stay closer to camp, we have a variety of activities for all abilities. You can check out a pair of cross-country skis or a fat-tire bike and take a spin around our groomed 10k loop or you can enjoy a cup of tea, an Antarctic book, or fun game in our camp library. We will fly to the colony once weather conditions permit. You will need to pack your personal belongings as well as your sleeping bag and pillow to take with you. Everything else will be provided for you at our field camp. The flight takes about 4 hours, traveling north-eastward over the Ronne Ice Shelf to the tip of Berkner Island where we may stop to refuel, if necessary. 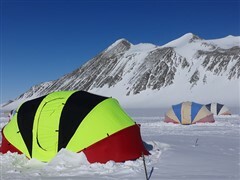 We land on sea ice where our staff has prepared a field camp 2-3 km from the colony. Our Emperor Field Camp Manager will give you a tour of the camp and review safety procedures for travel to and from the colony. In this unfamiliar environment and remote location, it is vital that you follow the instructions given by our experienced staff. Each day, we will immerse ourselves in the sights, sounds, and rhythms of the colony. Accompanied by our field guides and staff naturalist you will walk to the colony each day and spend as many hours as you’d like photographing penguins, seals, seabirds, and other coastal wildlife. 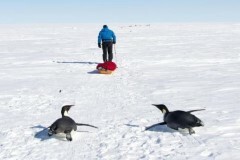 We provide small sleds and walking poles to help you transport your camera equipment between camp and the colony. The sea ice generally provides a hard surface to walk on. We make every effort not to disturb wildlife and strictly adhere to IAATO Visitor Guidelines. These guidelines include maintaining a precautionary distance of 5 m away from all wildlife. 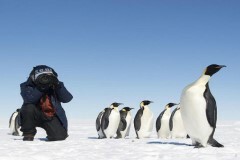 Our staff naturalist is on hand to answer any questions you may have about the wildlife and their unique adaptations to the Antarctic environment. 24-hour daylight allows us to spend as much time outdoors as we wish. Often times, the best lighting for photography is in the middle of the “night.” Our guides are happy to accommodate your desired time at the colony but please discuss your wishes with the guides in advance so they can tailor the camp schedule to include meals and sleep for everyone. 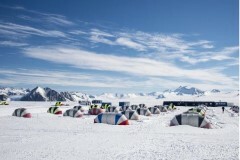 Our field staff will stay in close contact with Union Glacier Camp to identify the best ‘weather window' for your return flight. This will be based on weather forecasts and the anticipated arrival of the Ilyushin. 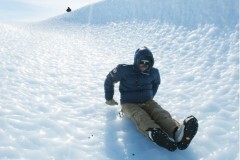 Depending on flights, you may have at least one day at the end of your experience to explore more of Union Glacier. 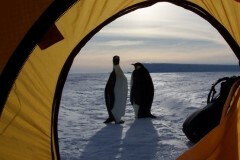 You will also enjoy a celebration dinner and receive a certificate to commemorate your Emperor Penguin Experience in Antarctica.